How to cook a delicious, juicy, whole chicken on the grill? To achieve an amazing result, you are going to have to learn how to spatchcock a chicken on your own. It is not as difficult or strange as it sounds, and there are plenty of tutorials and videos to show you the way, but we’ll give you the quick and easy version: to spatchcock is to butterfly – removing the backbone so that the chicken can lay flat on the grill, or baking sheet. Spatchcocking significantly reduces cooking time, at the same time allowing the meat to remain on the bone, keeping all deliciousness intact. This can easily be accomplished with a few carefully placed incisions of a knife, it can also be done with large kitchen shears as well. It may take a couple of times to get it right, but as you gather courage it will get easier and it is likely that you will even be commended for your cooking skills. As you remove the backbone, you can set it aside, possibly in the freezer, saving it for the next time you are ready to make your own chicken stock, an essential ingredient in Paleo cooking. With all these fragrant and intense Jamaican spices, we would suggest to bring a more neutral dish to the table. Sautéed carrots and zucchini are a wonderful option, feel free to use as few, or as many, spices as you like. Place all the ingredients, minus the chicken, in a food processor or blender and season to taste; pulse until you get a smooth paste. 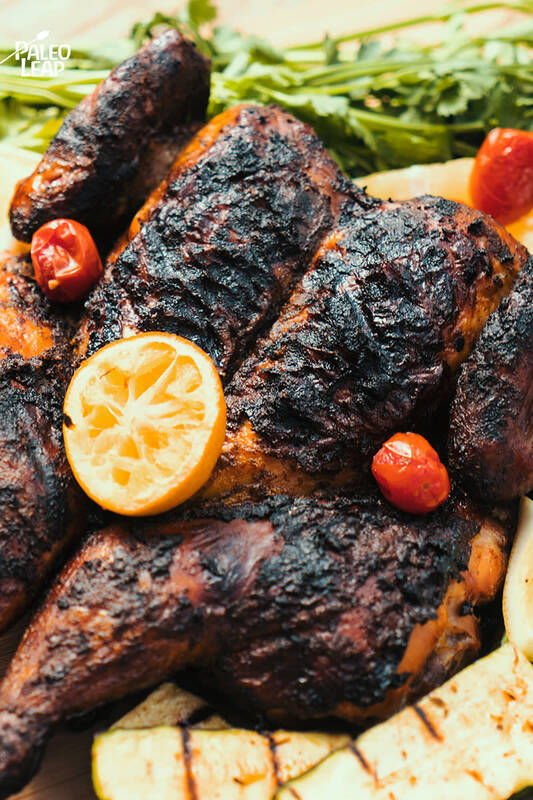 Rub the whole chicken with the jerk paste, making sure every part is well coated, and let it marinate for 2 hours. Place chicken on preheated grill and cook 35 to 40 minutes, or until cooked through, adjusting heat once in a while so it doesn’t get too hot. Let the chicken rest about 10 minutes before carving and serving.